Seven local church communities, including SsAM, take turns preparing and serving a hot, healthy breakfast in SsAM’s Auditorium to folks from the community who are hungry. This ministry is managed by Friendship House. A contemplative Rite II worship service in the sanctuary, with communion of bread and wine, and sermon. There is no formal music, but members of the congregation frequently offer songs or selections on the piano. This nondenominational service is a continuation of our Sunday Morning Breakfast Ministry. A lay-led service held in the SsAM chapel immediately follows the breakfast and includes hymns, prayers, and a homily. ADULT EDUCATION – Often a book discussion or a series of sessions with a special focus. Click on the link above, or contact the church office to find out what is currently being offered. CHILD CARE is offered every Sunday for children 3 and younger in the Education Suite. This is specifically for children who are too young to participate in the structured education program or sit through an entire worship service. During the summer and on special occasions when Sunday School is not in session, child care is offered for children age 6 and under. During the summer, children older than six are encouraged to join their parents in worship. SUNDAY SCHOOL – held in the SsAM Education Suite (Level 2A). Our principal parish Rite II Eucharist with music led by the SsAM Adult Choir, occasionally assisted by the SsAM Treble Choir or guest choirs. This service is where you get the full creative impact of the SsAM liturgies and get a sense of the mission and purpose of our congregation. Choral settings of the Eucharist (Kyrie, Gloria, Sanctus, etc.) 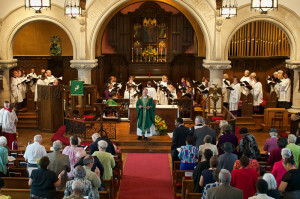 are frequently offered, and the congregation participates in a wide variety of hymns and service music. Although there is a strong tradition of classical music and Anglican chant, the service is often diversified with spirituals, Gospel music, jazz and world music depending on the season or special feast day. All are invited to the auditorium to join us for fellowship at the conclusion of the 10:30 a.m. Holy Eucharist. Members are asked to help feed the multitudes at the weekly SsAM Coffee Hour. 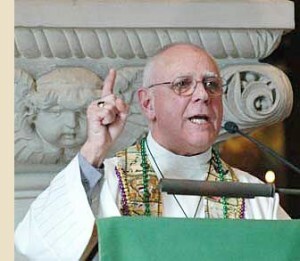 On a fifth Sunday, members of the Vestry and Committees are asked to contribute.